The country of Bangladesh is a major hub in the global garment industry with over 3 million workers and 4,500 factories, producing over $16 billion in exports for big brands like Zara, Carrefour, JC Penney and Wal-Mart. But Bangladesh also has the lowest minimum wage in the entire world: $24 per month. This law was established in 2006, at the same time a local NGO determined that it would take workers in the capital city of Dhaka $20 per month to meet the minimum calorie intake to survive. Food prices since then have tripled, which means that workers in the garment factories can’t even afford to feed themselves, let alone provide for their children. Life for these workers is a hellish daily struggle just to survive. But there has been some hope in the form of The Bangladesh Center for Worker Solidarity (BCWS), an NGO started in 2001 to peacefully address labor rights issues. The organization is well known in the community for its credible research, bringing awareness to the big issues, leadership training and conflict resolution. While BCWS has many accomplishments, it has always had to deal with the government looking over its shoulders, literally tapping phone lines, intercepting emails and following workers. In a desperate attempt to insure their survival, the garment workers are now putting their foot down and are demanding a pay increase to $72 per month (equal to $2 per day and $.35 per hour), but the government is stating that these actions and sentiments are not genuine, and workers are instead being coerced by BCWS (The factory in question has also filed criminal charges against the organization, reporting theft, vandalization and violence). 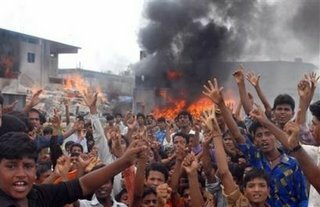 All of this has spurred weeks of violent protest in the streets of Dhaka, with workers burning furniture, looting, blocking traffic, and police have brutally reacted with batons and tear gas. 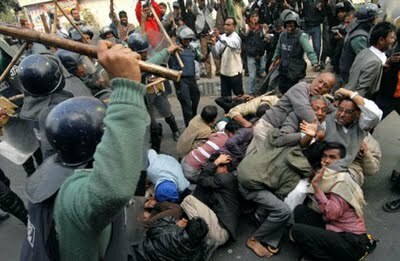 As of Thursday July 29, 2010, the government agreed to increase the minimum wage to $43 per month which will take effect on November 1, 2010, but the workers are not satisfied and violence continues to escalate. Click HERE to see a video of the street protests. The garment workers of Bangladesh need BCWS, and BCSW needs our help. 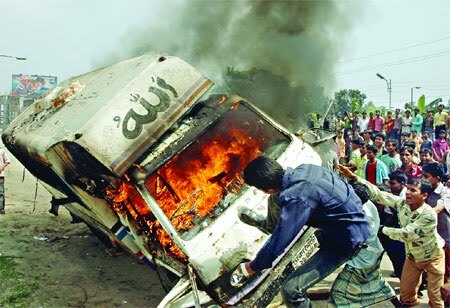 Click HERE to send a letter to the Prime Minister of Bangladesh demanding that their NGO status be reinstated. In addition please connect with organizations like Amnesty International and read about the Universal Declaration of Human Rights developed by the UN in 1948. In addition, your continued support of fair trade companies like Marigold help you to stand up to labor rights abuses by voting with your dollars and demanding fair treatment and wages for workers. By becoming an informed and engaged citizen of the world, and not turning a blind eye to the critical issue of human rights violations, you are helping to take the first step towards peace, prosperity and equality. Entry filed under: Bangladesh, Human rights, Labor rights. Tags: bangladesh, BCWS, garment factory, sweatfree communities, union.